What are the ups and downs? Is it a go or not? Getting the high-end cosmetic products isn’t enough for achieving a flawless look. You need to be able to see even the smallest details for a perfect makeup. You need also a good light so that you don’t end up with a fake feel to your look. This can only mean one thing: you need a reliable lighted mirror that also comes with accurate magnification. And if you’re not paying the high dollar for it either, then you’ve definitely hit the jackpot! 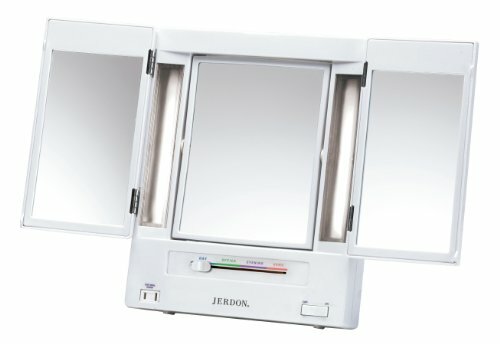 Let’s get things straight right from the beginning: The Jerdon Tri-Fold mirror is one of the most popular options out there and it’s not only its low price that makes it so attractive! The JGL9W bathroom and makeup mirror comes with touch fluorescent lighting and adjustable side mirrors that match any décor. The illumination is versatile and you can easily adjust magnification, for multiple viewing angles, regardless of your beauty needs. This is a lighted mirror so you’re well covered on getting the right amount of light too. 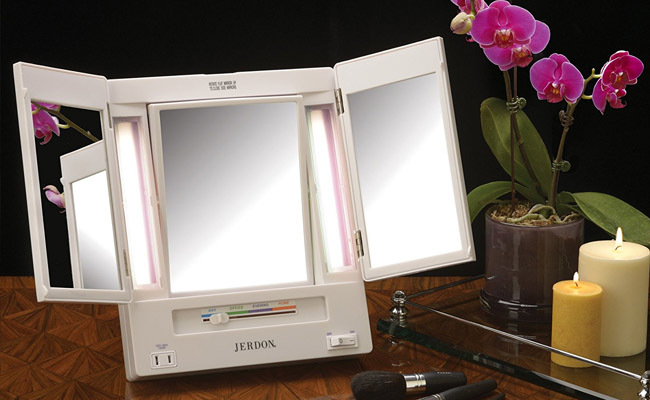 The mirror is a tri-fold model so you get a nice perspective on your face for makeup or other skin related routines. Still not sold? Let’s go over the details for the full picture! The JGL9W mirror is a great tool if you’re looking for a mirror with magnification. It comes with 1x and 5x magnification that helps you see the tiniest details on the skin. 5x magnification is more than enough for a closer look on your skin and still have a good feel about yourself, if you ask us! The center is adjustable and it swivels from 1x to 5x magnification. The zoom feature is amazing for the details of your makeup and hair styles. The 5x magnification is helpful for applying makeup in the zone zones more difficult to reach, while the 1x magnification gives a good view for your hair do. Apart from the magnification that isn’t just adjustable, but also accurate and reliable, the mirror comes with good lighting and a built-in electrical outlet. The mirror is highly adjustable and you may choose one of the 4 settings for daytime, evening, home and office environments. Going through the lighting settings isn’t difficult and you don’t need to worry about finding on your own which level of brightness may work the best for your evening makeup. The mirror does that for you instead. The fluorescent lighting is glare-free and each of the settings is color-corrected. The built-in electrical outlet is another useful feature on the mirror and you can plug in your curling iron or any other device you may need. Let’s not forget that the mirror stands on itself on your countertop so that you have all your beauty tools within reach. The back of the mirror is adjustable so you can have just the right angle for different situations. The unit has a good size that satisfies most. It folds flat so it turns into a great mirror to take when traveling. It’s well made and has a durability feel to it. It presents an elegant and attractive finish, looking nice on any countertop. On top of everything else, the mirror isn’t heavyweight and it’s easy to clean too. Loaded with so many useful and important features, the tri-fold lighted mirror is a great investment for any makeup enthusiast. It’s highly adjustable on many levels, it’s easy to use and easy to carry around when traveling. Its looks are nice and the price is dead on attractive. Still on the fence?